"122 Brook to 41 Sheldon" by Elena Foraker, Special Collections et al. 2018. 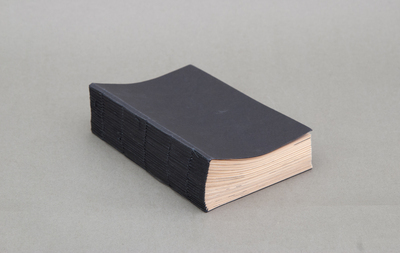 608 page hand-sewn book featuring every letter or number found on a block in Providence. Each word or phrase is accompanied by the shape of the material it was found on (gas meter, stop sign, sticker, etc). The block I chose is very residential and I had to peer around houses to collect the text. The letters are skewed to demonstrate this action of viewing everything at strange angles.